Those people who within are cloaked with agiann - with ignorance, then what happens in this ignorance? Bhaee math madhim - their math - understanding becomes madhim - [to explain the meaning of madhim] - there are three types of being on this earth: utham, madhim and kanihst. People who are utham are always looking for the spiritual gains and always looking for a connection to their Lord and master. The second state of being are madhim - where sometimes we are looking to the spiritual gains and sometimes we are looking down to the material gains and kanisht is the state of being where we only look at material gains in this world. Satguru Patshah jee says in this ignorance our mind is being pulled down from higher state of being to lower state of being where we are focusing more on the material gain. Sathigur kee paratheeth naahee - because we have no faith in this true Guru. In essence, ignorance is to have no faith in the Guru. Those who have no faith in the Satguru they are in ignorance - Satgurujee says. Inside that person wells up kapatt - deceit. Sabh kapatto kar jaanai - s/he thinks that this whole world is trying to deceive each other. When you have deception inside you, when you have lies inside you, you see lies everywhere else. Kapattae khapehi khapaahee - Satguru Patshahjee says that person in their deceit, in their falsehood has burnt themselves and burns others. They do not bring, chith n aavai - they do not bring into their consciousness the will of the true Guru. Aapanai suaae firaahee - they walk around, they wonder around for their own suaae - own interest, for their own gains. Satguru Patshahjee says that person is walking around for their own gain, for their own selfish gains. But if the Guru is to bless even that being with His kirpa, with His grace, thaa naanak sabadh samaahee - even that person can be absorbed into the Shabad, into the word of the Guru, Satgurujee says. Those people who follow their mind, they are viaapae - they are attacked by the mohi - by attachment to this illusion, attachment to this world. Dhoojai bhaae manooaa thir naahi - their mind is never stable because they are in love with doojai - this love of duality, this love of material world, material things, illusionary pleasures. They remain burning day and night and they are burnt by their ego and they burn others with their ego as well. Within they have lobh - greed and mehaa gubaaraa- Guru Sahibjee says the greed is greatest pitch darkness. The greatest darkness is our greed. Thin kai nikatt n koee jaahi - no one goes close to them. Why? Because people know that in greed this person only looks out for themselves, looks out for their greed, looks out for what they can get out of this situation - therefore no one gets close to them. They are sad themselves. But what do we define as dukh? Bhai Mati Daasjee is being cut in half and we would define that as dukh. But Bhai Mati Daasjee is enjoying the fact that he can give his life for the true Guru - Guru Teg Bahadur Sahibjee. So when we talk about dukh and sukh in Gurbani, Maharajee is saying oue aap dhukhee - those people who within inside their minds and souls are dukhi sukh kabehoo n paavehi - they never find spiritual peace. They are wondering again and again in reincarnation. Gursikh on the other hand may have outer dukh but inside they have complete sukh, complete poise and balance. Guru goes on to define the dukh. What is the dukh? Janam marehi mar jaahi - to be born again and again and again and to be mar jaahi - to be dead within, to be dead to spirituality - that is the true pain, that's the true dukh. Satugurjee says, if the true Lord wants to bakhas - wants to forgive even these people then j gur charanee chith laahi - that can only happen if they focus their consciousness on the Lotus Feet of the Satguru. That person who is bhaaeiaa - who is accepting to Waheguru only that person is accepted and respected as saint and bhagat - a devotee. Only those beings are bichakhan - are wise - literally the one who can see well. 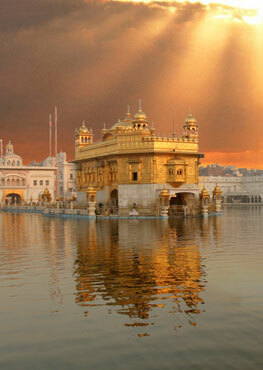 Only those are great wise men and women jinee har dhiaaeiaa - who have meditated upon hari - my Waheguru. The treasure of the Name of the lord which is immortal, this is their only sustenance. Gurujee says, if I was to find the dhoor - the dust of the saints then I would masathak laaeiaa - I would apply it to my forehead. How to do this? Read the lives of the Gursikhs and the dhoor - the dust you will get is their virtues, their ways of how they dealt with situations. This is the dust applied to your forehead. What does it mean - applying the dust? Take it into your mind - those dramas from the times of the Gursikhs, those anecdotes from the times of the Gursikhs into your life and taking their dust and applying it to your forehead. Gurujee says those beings are puneeth - are purified who har theerath naaeiaa - who bathe in the true theerath - the true pilgrimage, true place of pilgrimage which is within - the name of God. So Satguru Sahibjee is telling us the state of a Manmukh and Gursikh as well. May Guru Sahibjee take us outside the total pitch blackness of greed, anger and ego and allow us to take the dust of the feet of saints in our lives.